Macaroons are the most coconut-y of all cookies. They’re also probably one of the easiest vegan and gluten-free cookies I’ve ever made. These coconut macaroons are chewy and moist on the inside, crispy and golden on the outside. They are delicious by themselves but even more irresistible when dipped in dark chocolate and sprinkled with a tiny pinch of crunchy sea salt. Soft, tender amazingness. I have a huge spot in my heart for coconut macaroons. My grandma used to make them on a Christmas cookie platter every year and I could never get enough of them. I distinctly remember the first year when I was old enough to help my grandmother bake Christmas cookies. I stayed overnight at her house one of the weekends in December and we baked a batch after batch of her fluffy coconut macaroons. We also baked gingerbread cookies, Linzer cookies, vanilla crescents, and snowball cookies. My grandma always talked with pride when telling me the history of her recipes. Some of them came from her great grandmother and were passed from generation to generation; some of them were from a professional baker who baked for royalty, as she would say. Of course, there’s no way of knowing for sure, but it sounds fantastical. Every Christmas she would make at least a dozen different Christmas cookies, but my favorite were always her coconut macaroons. There’s just something irresistible about the contrast of the coconut-y base and the dark chocolate at the bottom and on top. This version of coconut macaroons is nothing like the original (due to the lack of eggs), but it’s delicious nonetheless. 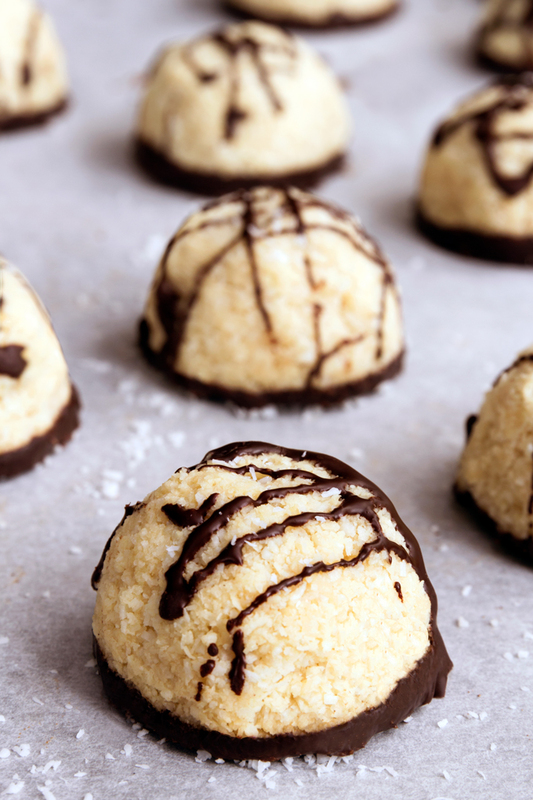 The coconut macaroons are quick, easy, and beautiful. As you might have guessed, the main ingredient in these coconut macaroons is desiccated coconut (sometimes called macaroon coconut). Desiccated coconut is a very finely ground coconut with most of the moisture removed (3% moisture content max). It’s usually “powdery” because it’s in such small pieces, unsweetened, and contains no additives. Shredded coconut, on the other hand, retains more moisture, has longer shreds (about half an inch to an inch long), and is more often than not sweetened. Some people prefer using big coconut chips, others prefer the more delicate consistency of the finely shredded coconut. You can find the former at any major grocery store, while the later is only available in specialty stores or online. Whichever form you choose, just keep in mind that the finer the coconut is, the more delicate and denser the macaroons will be. While you can stick with only coconut (for the dry ingredients), I prefer macaroons that are more cookie-like. That’s why I use almond flour together with the desiccated coconut. Another ingredient that sets these coconut macaroons apart is coconut butter, which makes these macaroons rich and buttery. Coconut butter has a creamy consistency and retains a decent amount of sweetness. You can either buy already made coconut butter or make your own. It’s way cheaper to make your own and really not that difficult. Simply put some desiccated coconut into a high-speed blender and blend until you have a creamy coconut butter. (See the “recipe” for homemade coconut butter below). To sweeten these cookies, I prefer maple syrup for its rich flavor. But you can go with any liquid sweetener you like. The proper color of macaroons is a matter of great controversy and personal taste. Snowy-white or toasted golden? If you prefer classic white macaroon, keep the coconut raw. If you prefer golden brown macaroons, toast the coconut until it’s golden brown. Toasting not only turns the white coconut meat into golden color, but it also gives it a delicate crunch with a deep coconut flavor. Baking the macaroons for a little longer, until they become golden brown, also brings out their nutty flavor. 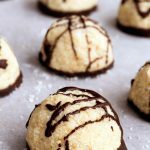 Of course, you can keep these macaroons raw (I often do), but for a more traditional dessert, you’ll probably want to bake them. For baking, bring the oven temperature down to just 275°F (135°F) and bake the macaroons for 25-30 minutes (so the insides are cooked all the way before the outside crust gets too brown). Finally, let’s quickly talk chocolate. To drizzle or not to drizzle? I love the combination of coconut, almond, and chocolate, so I always dip the bottom of the macaroons in chocolate and drizzle a bit of chocolate on top. But, if you’re not a chocolate fan, or prefer the pure coconut/almond flavor, skip the chocolate. 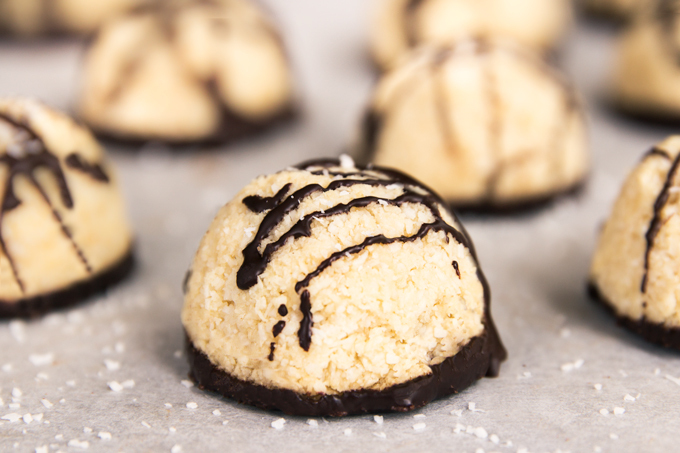 These raw coconut macaroons are fantastic either way. I promise. These buttery coconut macaroons are chewy and moist on the inside, crispy and golden on the outside. They are vegan, paleo, and naturally sweetened. Preheat the oven to 275°F (135°C). Line a baking sheet with parchment paper. In a large bowl, stir together the almond flour, desiccated coconut, salt, maple syrup, melted coconut butter, and vanilla extract until thoroughly combined. The dough will be thick and sticky. Using a 2" (5 cm) ice cream scoop, scoop a ball of dough and pack it in so that the top is flat. Repeat with the rest of the dough. You don't have to set the macaroons more than 1 1/2" (3.8 cm) apart on the baking sheet because they won't spread during baking. Bake for 15 minutes, then rotate the pan and bake for 10-15 minutes more, until the macaroons are a bit golden around the edges. Watch them closely during the last 5-10 minutes of baking. Remove them from the oven and let them cool completely. For the raw version, dehydrate the macaroons at 145°F (62°C) for the first hour, then reduce the temperature to 118°F (48°C) and keep checking on them every hour until they are firm and crisp on the outside. If you’re impatient, dehydrate them at 150°F (65°C) and they’ll be ready in a couple hours. In a double boiler, melt the chocolate and coconut oil together over low-medium heat, stirring frequently until smooth. Dip each macaroon into the chocolate, either by holding the top and partially submerging it, or rolling it in the chocolate using a fork. Shake off the excess over the bowl, then place the finished pieces on the parchment paper-lined baking sheet upside down, so the chocolate coating is facing upward. Let the chocolate harden (you can place the macaroons in the fridge or the freezer to speed up the hardening process). Flip each macaroon chocolate-side down and drizzle the remaining chocolate on top. (If the chocolate isn't pour-able anymore, reheat it in the double broiler). 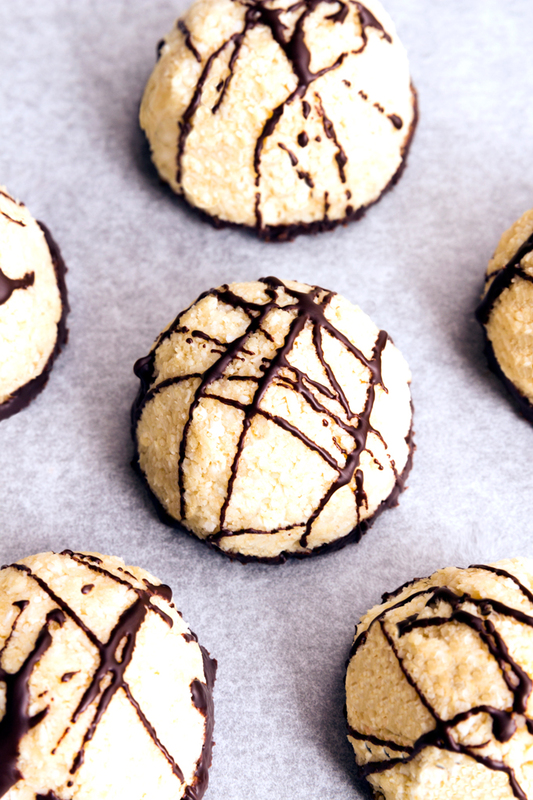 Store leftover macaroons in an airtight container in the refrigerator for up to 1 week. Put the coconut shreds/flakes into a high-speed blender and blend until smooth. Depending on your blender, it will take anywhere between 5-10 minutes. Stop and scrape down the sides of the machine as needed if the blade isn’t catching and blending the coconut. The coconut will go through three stages. The texture will go from a finely shredded coconut to a grainy liquid, until finely it will turn into a smooth, thick liquid. The finished butter will seem runny, but when you taste it the texture will be thick and sticky. Store any leftover coconut butter in a glass jar covered with a lid at a room temperature. There's no need to refrigerate coconut butter. *I used unsweetened vegan chocolate, and loved it. However, it is VERY bitter. **You'll only need half the amount of coconut butter (2 cups of desiccated coconut yield about 1/2 cup of coconut butter). The reason you don't want to use less than 2 cups of desiccated coconut is to make it easier for your blender to "grab" onto the coconut and blend it into a smooth consistency. 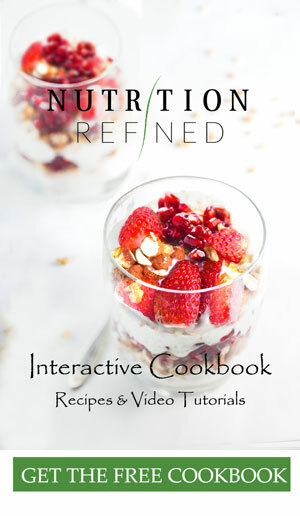 This recipe has been adapted from Angela Liddon's cookbook Oh She Glows Every Day.